I am 40 something and live in Kent with my hubby Bruce and my dog Gromit. (Sadly Gromit passed away on 11th Feb 2011 aged 15 1/2, RIP my beloved furbaby). 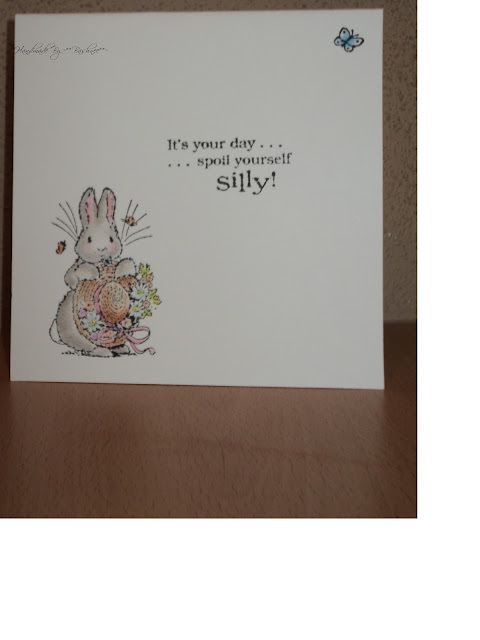 When I get spare time I like to craft including card making & cross stitch. I've just started to do some baking now, which I really enjoy. I also like to go to the gym (well I need to after all those cakes I've started to make lol). In Jan 2012 we took in a rescue dog. He was around a year old, but had no name. He's now been with us for 10 months, and it's great! Jazz has definitely made himself at home. I belong to docrafts forum where I have made some good syber friends. 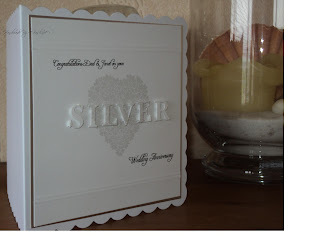 To view my full gallery just click the Docrafts link below. 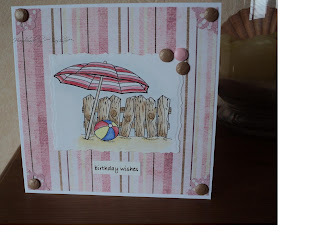 Digi / Stamping challenge ~ either garden or seaside. Just wish I was sitting on that beach right now!! Photo corner & card candy to finish. Hope you are all enjoying your Bank Holiday so far. 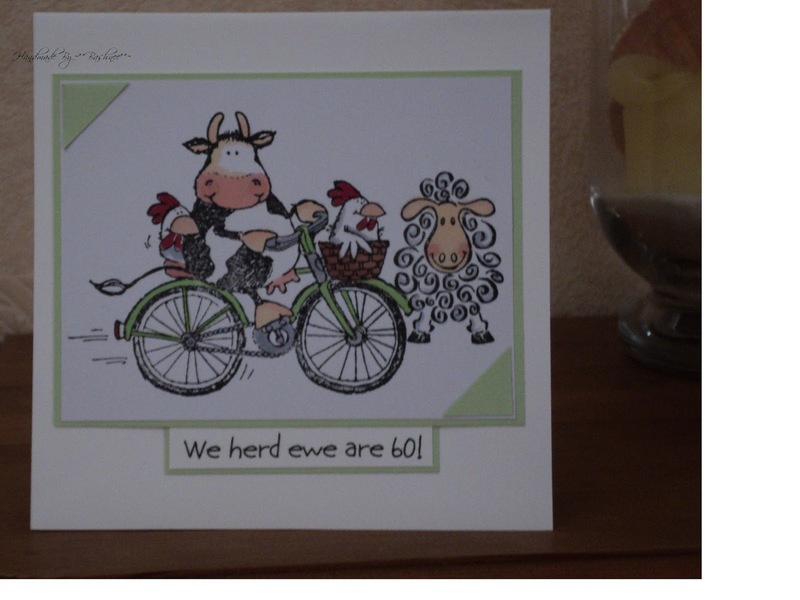 Just did this quick card for a relative of mine who will be 60 next week. 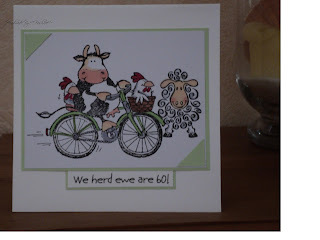 Images: Anitas 'just for ewe' stamped & masked before stamping Penny Black 'for a spin'. All coloured with promarkers. Sentiment: Computer generated with the play on words! Matted onto green card & then base card. 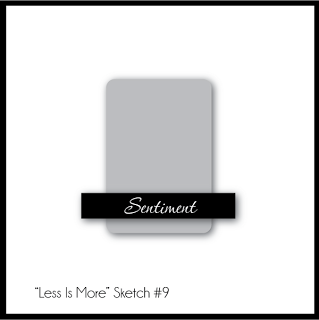 Jen set this great sketch over on Less Is More this week, here's my take on it. I think it looked better in my head, but you can't win them all lol!! 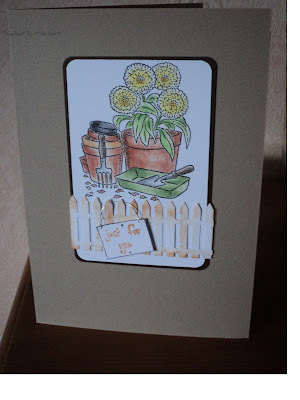 Image ~ Stamp- a -picture garden coloured with prisma pencils. 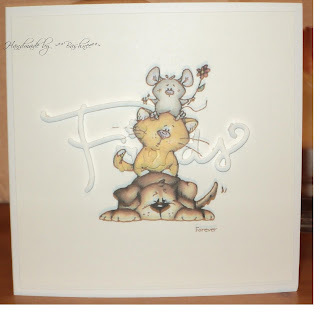 Sentiment ~ element taken from Fizzy Moon Celebrations clear stamp set which I attached some wire & 3D foam. As always comments very welcome. 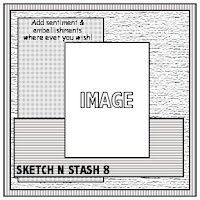 Other sentiment ~ computer generated. Scored two lines both top and bottom & layered whole thing on silver card before attaching to card base. Thank you so much for the inspiration girls! 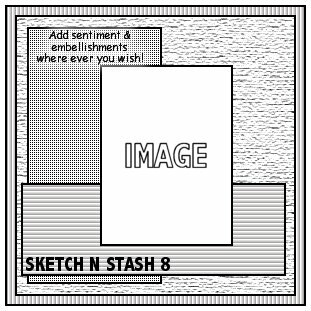 This is my entry for Sketch n stash 8. It's also my card for the digi / stamp challenge I set over on docrafts with a theme of allotments which must have either fruit or vegetables somewhere on the card. 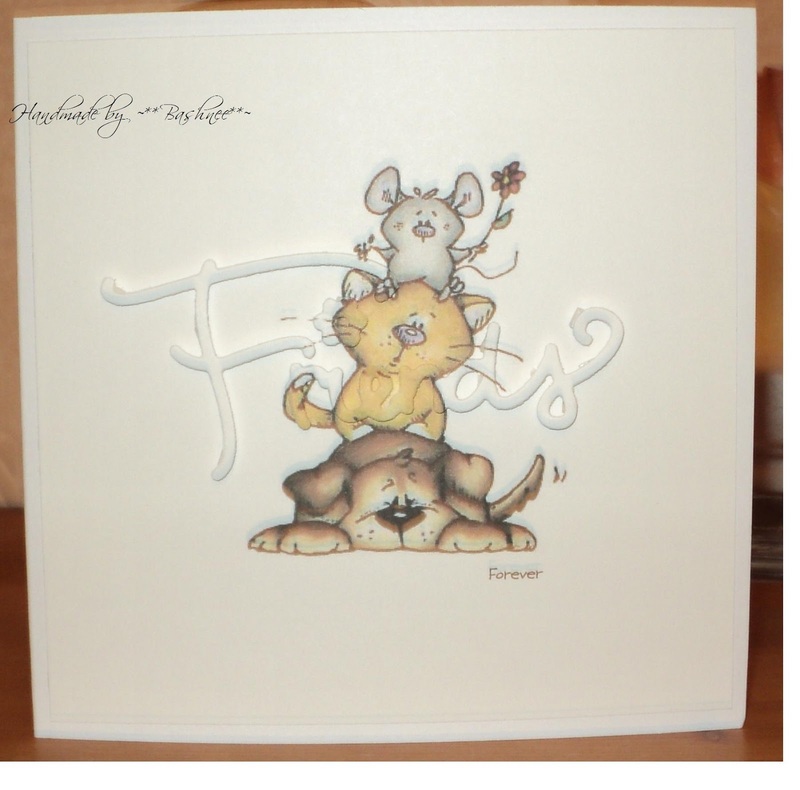 Stamp ~ Housemouse sleeping with strawberries stamped with rich cocoa memento ink & coloured with prisma pencils. 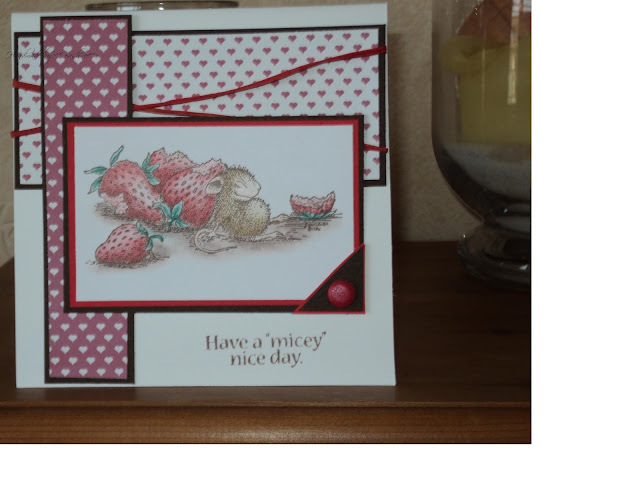 Sentiment ~ Penny Black micey day set stamped with rich cocoa ink. Thanks for stopping by, all comments welcome! Well what a challenge the girls from Less is More set this week! I took inspiration from Chrissies card but didn't think I'd ever be able to do this. I did cheat a little and used one of my sizzix word dies 'friends' as I didn't trust myself to use single letters & match them up lol!! I thought this image lended itself perfectly to the sentiment. I printed the image twice adding the word forever next to one of the images. Then using my die cut out friends from the other image. The fiddlest part was cutting my 3D foam small enough to mount the sentiment! I love this new technique and am going to practice it, never know I may be brave enough to try single letters! The finished card looks much better in real life, the photo doesn't do justice to the raised sentiment. Thanks girls for a great challenge! Had to get my thinking cap on for this one! One layer card (no problem, I like one layer cards) BUT also a film!! Not a clue, so got all of my stamps out to get inspiration when I came across this one, not used it for ages & it hit me straight away. That's the good thing about challenges right? Noahs ark challenge on docrafts ~ Butterflies. Feel free to grab my blinki! The home of one cute rottie! 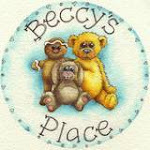 I just love Beccys images!